The Germany pavilion itself is a classic Bavarian village. When I set foot in EPCOT’s Germany I feel like I set foot in a fairytale village: the colors, the music, the glorious fountain. The fountain is where we tell today’s story. 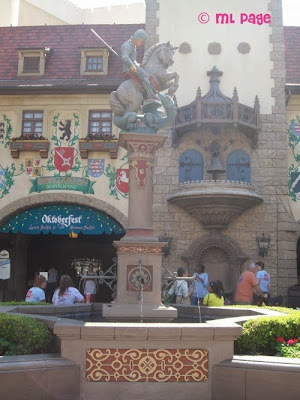 In the heart of the Germany pavilion you will see the fountain with a statue atop. The statue depicts the mighty St. George slaying a dragon. In typical European versions of George’s story he is a crusader. George’s travels had brought him to Libya where he met a poor old hermit. The hermit explained to George that their village was under attack. A dragon had been coming to their land and taking a sacrificial “maiden”. Day after day the dragon returned, and left killing a beautiful young girl. Only one fair maiden remained- the king’s daughter. The hermit, explained how distraught everyone was for they needed to find a knight brave enough to slay the dragon. Furthermore, the king had promised his daughter’s hand in marriage to whomever saved her life. Being brave and kingly himself, George decided he would attempt to save the princess. The next morning he set out to the dragon’s lair. He saw all the women leading the princess, Sabra, to sacrifice. George moved full speed ahead, stopping to reassure the women and the princess, and then entered the dragon’s valley. As soon as the dragon noticed him he came roaring out at George. The fearless young crusader threw his spear at the dragon, but on impact it was the spear that shattered. George was thrown from his horse and rolled under an orange tree. The tree was luckily enchanged and George could not be harmed by the dragon while hidden here. When he recovered from his fall he charged the dragon. When he needed a break he ran back for the tree. Finally, he struck the dragon under its wing where there were no scales to protect it and it fell dead at George’s feet. With Princesses being saved and saving themselves at so many attractions, St. George’s heroism is a great tale of a man, who comes to be Prince thanks to his bravery. Theodore, a man who is said in some versions to have accompanied George (and in some other versions it is Theodore, not George, who slays the dragon) can be seen on a statue over in the Italy pavilion as well. This article was written by Melissa and was first posted on The Disney Moms Blog. Welcome to our magical place! LevixDisney Mickey Jeans- Photo Courtesy of Disney Levi’s x Disney Mickey Mouse collaboration launched today! Picturing Disney welcomes you to the 8th Annual Black Friday Book Bonanza , hosted by Reading Reality and Caffeinated Reviewer . Ohana means Family (as in Family-Style Dining)! Alice in Wonderland Themed Baby Shower Games! Win a One Year Subscription to WDW Magazine! Picturing Disney is not affiliated with the Walt Disney family of companies in any way. 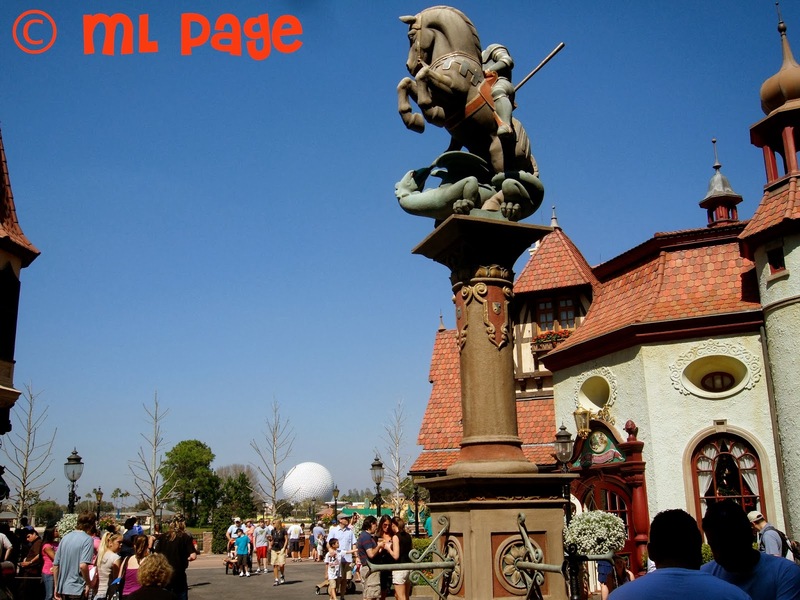 We are a fan site for those who love Disney Parks, products, services, and the legacy of Walt Disney. Additionally, Picturing Disney is often given free samples or paid in return for advertisement. All recommendations and reviews are honest and fair as we aim to bring you the best of Disney.